On Tuesday 28th August 1990 Mark Radcliffe started out as the presenter of the weekly Radio 5 show 'Hit The North'. It was aimed at a fairly young audience and it was from here that he was able to experiment with new radio ideas and develop his own style which he was to take to the Graveyard Shift. The show soon moved to Wednesdays and was started at the slightly peculiar time of 10:10pm - 12:00pm. The big cheeses at Radio 5 wanted a show that was a showcase for northern bands and anything of interest to 'the youth market' such as drugs, the environment and the like. Mark was doing outside broadcasts work at the time and the bosses at the BBC wanted him to keep on doing that. Frank Mansfield (Radio 5 boss) apparently had to do some smooth talking to get him to do Hit the North. Marc 'Lard' Riley who knew Mark Radcliffe from the days when Mark produced one of his John Peel Creepers sessions soon blagged his way onto the show. He was a record plugger and so kept on trying to persuade Mark to play Northside and Pixie's records. Lard refused to leave Mark alone so Mark finally gave Lard a gossip column on the show and also produced the show for a while. Lard never had any gossip so he and Mark would just take the piss out of each other during the records. Mark Radcliffe was quite camera shy and so was always photographed with a big hood over his head which created some mystery about him. This together with the music he played and the Quality Items soon gave him a very loyal cult following. The show also managed to get nominated for a Sony Award. They had a lot of bands coming in to do sessions for the show. It was on Hit The North that Oasis played their first radio session in July 1992 which included a version of Cigarettes and Alcohol. Caroline Elleray who was a partner in management company 'Caromac' along with 'Factory Records' Manager Macca shared an office with Lard; so when she heard Oasis she liked them and persuaded Lard to get them in session. Of course the BBC has now lost this classic Hit The North Session although rumours that Lard was flogging copies of this session for a tenner each down at The Flea And Hand Shandy and totally untrue. Four of the shows sessions were released on the 'Seconds Out' compilation album. It was here that they also developed many of their quality items. They had one called Radcliffe's Alphabetical which was later repeated on the Graveyard Shift under the name of the A-Z of Cults. 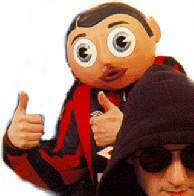 They also had quite a few guests on the show such as Frank Sidebottom (Right) and Mr Methane. It was from this time that they got their nicknames: Scrawny Boy (Mark Radcliffe), Lardy Boy (Marc Riley) and Pumpy Boy (Frank Sidebottom). Many of the people who worked on the show stayed on to work on the Graveyard Shift. Lis Roberts produced the show when Lard became a full time sidekick. Uncle Tony at this time was just an engineer along with Steve (Who often informed us what he had eaten for his tea). Smiffy was also on the knobs at this time. Whilst doing Hit The North Mark managed to find time to do Out On Blue Six which was a weekly one hour programme on Radio 1. When Nicky Campbell finally left the 10-12pm slot on Radio 1 Mark and Lard were able to jump into it, another step up the ladder to fame and fortune. They did a roadshow from Grange - Over - Sands where only about 5 people turned up. They did a Radio 1 style 'Bits and Pieces' competition with a track by Napalm Death, and 'Descanting the Insalubrious' by Carcass, which needless to say, no-one got, Pumpy Boy also lost a shoe down the toilet.. Some of the gifts included 100 tokens for a flannel, and a combined foot-spa and fondue set. They also did one in a tent when they went camping. The only audience there were a few fellow campers. After finishing Hit The North they were ready to begin what most Mark & Lard fans would agree was the greatest radio show ever. This was The Graveyard Shift. If you know anything else about Hit The North then please email me .